Amazing INSERT Viewers are different from our Classic Amazing Cards and have no stereo-image inside. You can place the Stereo-Card between the yellow lines into the Viewer and then see the image in full 3D-Stereo! Squeeze the Viewer to focus as usual. 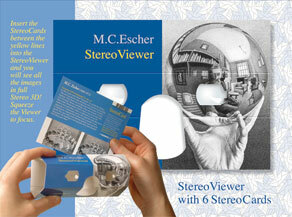 With one Stereoviewer you can see the 3D-Stereo images of all INSERT Stereo-cards in our collection! 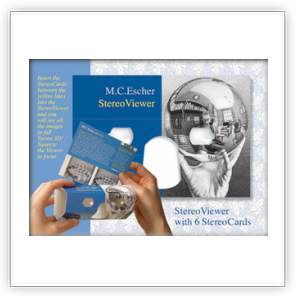 Now your customer can buy one INSERT Viewer with several Stereo Cards. This product is especially interesting for museums because there is much space for customization. 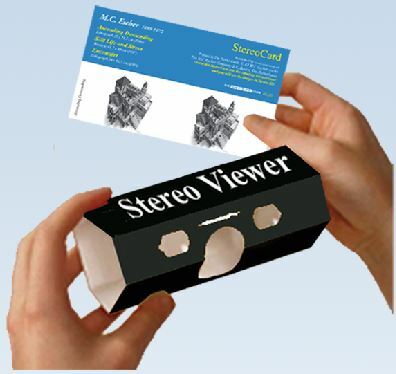 The dimension of a Stereo-Card is 10 x 14 cm. 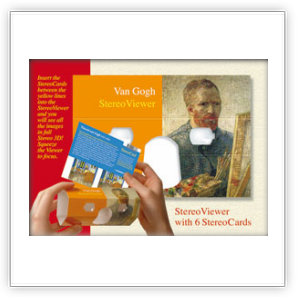 Stereo-Boxes make nice gifts and contain one Viewer and different INSERT 3D-Stereo Cards of a subject. 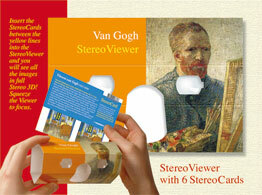 Currently we have Escher (9 x 3D-Stereo images) and Van Gogh (6 x 3D-Stereo images) boxes available.